Image: Jim Cooke, Photo: Getty. In her book Women Who Work: Rewriting the Rules of Success, Ivanka Trump writes that changing “the narrative around women and work once and for all” has become her life’s mission. With this book, she purportedly hopes to “provide solutions” for women who have jobs and personal lives. “Like you,” she ends her introduction rather pithily, “I’m a woman who works—at every aspect of my life.” But if Ivanka is a woman who works, then who are the people who thought of the “solutions” that Ivanka borrows and sells as her own? At whose expense does Ivanka profit? Numerous reviews of the book, including that of Jezebel’s Stassa Edwards, note that Women Who Work is more of a trophy for Ivanka than it is any sort of useful text. In it, she speaks directly to women who are like her: wealthy, with resources, in a job with enough flexibility and stability that calling a meeting with your boss to say you just have to leave the office at 5 p.m. to care for your children is enough to engender permanent mutual respect and a livable work-life balance. 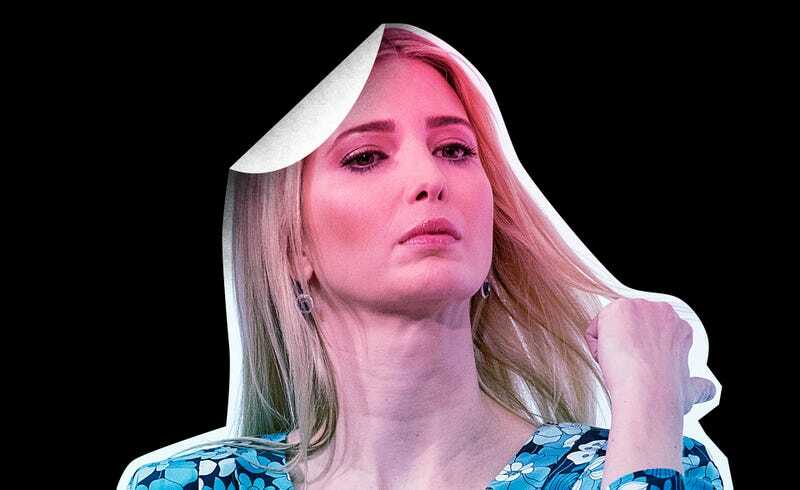 But the book is also a brazen work of aggregation, in which Ivanka patches together the careers of a group of professional coaches, psychologists, and prominent motivators to create something that is somehow less than the sum of its parts; a cheapened, superficial Pinterest board of ideas, bound together by little other than the fact that Ivanka has decided that they support her personal brand. ﻿Inspired by these women—and bolstered by conversations I’ve had, and those happening around me—I’ve curated my best thinking, as well as that of so many others, in the pages of this book. I’ve gathered the most important and essential advice that we shared on IvankaTrump.com, plus my favorite books, TED Talks, podcasts, and other resources to help women come together to celebrate how we can achieve success on our own terms, measured by our own individual passions and priorities. Of the 70,000 words in her book, almost 23,000 (approximately 33 percent) are, literally, not her words—that is, they’re quotations or bulleted guides from another writer. There are, by my count, 468 source citations at the back of the book, and CNN reporter Betsy Klein counts over 130 names referenced at some point throughout. And these aren’t regular academic citations that work together to form a new, original thesis. Instead, Ivanka cites frequently and heavily, often using uninterrupted paragraphs from other books, in places she could easily paraphrase or draw from her own life. 2. Practice in front of an audience. When I rehearsed my early speeches, I delivered them solo. Classic studies by the late Stanford psychologist Robert Zajonc demonstrated that the mere presence of other people raises our arousal. If you practice alone, you won’t have a chance to adjust to that arousal. Several lines down, in a tip called “RENAME YOUR ANXIETY ‘EXCITEMENT,’” she goes on to quote Grant, but not a quote that appears in that blog post. The initial post is not cited, but the IvankaTrump.com condensed reprint is, in the Notes section at the end of the book. The second instance also involves one of Grant’s blog posts, but is slightly more convoluted. Grant published a blog post entitled, “Negotiating Your Salary Without Playing Hardball,” in February 2014 on LinkedIn. That same blog post was republished on IvankaTrump.com in September 2015, without any reference to the fact that the blog post had initially been published elsewhere. Then, in the book’s section on salary negotiation, Ivanka goes one step further and heavily quotes Grant’s negotiation advice. At one point, she abruptly stops quoting him and uses his language as her own. Advice-seeking is a powerful way to have influence without authority. If you’re worried about manipulation, I have some good news: it doesn’t work if it’s not authentic. When Liljenquist instructed people to use advice-seeking as an influence strategy, their negotiating counterparts saw right through it. It was only effective when people were genuinely interested in learning from the contacts they sought out. In most situations, I find that this strategy is just as effective as the hardball approach. When it doesn’t work, people sometimes develop doubts about taking the job, and it becomes appropriate to continue interviewing elsewhere. Once a comparable offer comes in, it’s still not necessary to play hardball. Once again, the IvankaTrump.com article is cited in the Notes section, but the original is not. In her acknowledgements, she thanks Grant, along with other IvankaTrump.com “Entrepreneurs in Residence,” Elizabeth Cronise McLaughlin, Rosie Pope, Samantha Boardman, and Alexa von Tobel, all of whom are heavily quoted throughout the book as well. Neither Grant nor a representative of Ivanka has responded to Jezebel’s requests for comment. Women Who Work doesn’t just take academic advantage of Ivanka’s contemporaries. It also coopts the stories of women doing actual work in service of Ivanka’s nonexistent thesis. The book tells the story of Reshma Saujani, founder of Girls Who Code, as evidence of the profoundly banal observation, “Most women’s lives, past their early twenties, look more like a tree than a road.” Since the book’s publication, Saujani has explicitly condemned Ivanka’s use of her biography. “There are a few articles you’ve seemed to miss that you should really read given your role in the White House,” the post continues, citing pieces on universal childcare, paternity leave, and the gender leadership gap for women of color. So much of the Trump empire in general is based on the reappropriation of other people’s work. Since becoming president, Donald Trump has taken credit for job growth set into motion during the Obama years; for investments that companies committed to independent of his policies; for the country’s nonexistent optimism. The same is true for Donald’s businesses—from Trump Steaks that are actually produced by Bush Brothers Provisions Co., to Trump Airlines, a fleet of Eastern Air Lines Boeing 727s with a “TRUMP” painted across the side, to Trump buildings in which his involvement is limited solely to licensing his name for the gold façade—the Trumps tend to do business by slapping their infamous name over labor performed by others. Both Donald and Ivanka seem to believe that every thing is at once fodder for them to co-opt for personal gain, and evidence of their own righteousness. It’s the ultimate gluttony, and one that the Trumps seemingly have no issue indulging in—to know yourself to be unable to contribute meaningfully to growth or improvement, but to be unable to resist forcing yourself into the narrative. To buy the whole scrapbook and draw yourself into the sides of the photographs, to say that you were there doing good work all along, too. In a section of the book on delegation, Ivanka recommends a good rule of thumb: “If you really can do something better than anyone else and it’s important to the business, then do it yourself. At the same time, don’t do anything that someone else can do better than you.” In a sense, Ivanka took her own advice—or, at least, she took the advice of an unnamed “finance billionaire” who first taught her the importance of delegating. Ivanka wasn’t the best person to write a book advising other professional woman, so, essentially, she didn’t. Correction: A previous version of this story said Betsy Klein counted 280 people in the book; in her article, she writes that she actually counted over 130 people. Jezebel regrets the error.